We strongly believe in preventative dental care and encourage our patients to bring their children with them from birth so that they become familiar with the practice and the team and are confident and happy attending. We will take special care of your child to make them feel safe and cared for. Fluoride applications are a safe and effective way to safeguard your child's growing teeth from developing decay. The fluoride is painted onto the surface of the teeth, helping to strengthen them. Treating a child from a young age allows the dentist to spot early signs of underbites, cross bites or overbites developing. 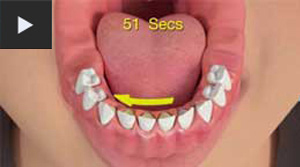 As with most dental problems, the sooner you can start to treat it, the quicker it can be resolved. Our hygienists also provide children's hygiene appointments; showing children how to properly brush their teeth and helping those with braces maintain good oral hygiene. Contact the practice today to introduce your child to the team 02890 471070.